Shades are popular in homes and businesses alike. They look great and help keep rooms cool and comfortable year-round. Blind Ideas in Glendale, Arizona, offers a variety of different shades, from traditional roman shades to more modern-looking woven shades. No matter the style you choose, you'll love how well they'll complement your space's look and feel. Roller shades are a proven aid for interior temperature and light control. The simple, modern design available in a variety of fabrics will stylishly suit any window application. Choose this energy-efficient shade with chain-operated clutch controls or with motorized controls. High-quality fabrics and durable, engineered parts provide the best in window coverings for hot temperatures. Graphic shades make your window treatment uniquely yours. Decorate any room in the house with a tranquil setting of the beach or a beautiful sunset. You can also put a graphic of your favorite sports team on the blackout roller shade in your media room for theater-quality darkness while you watch the game. Blind Ideas can transfer any image to your shade. Graphic shades or blinds can also provide additional advertising space for commercial buildings. These are an economical method of promoting your business and do not conflict with local government regulations or restrictions regarding advertising space since these are not billboards - they are window coverings. This dual purpose use makes them all the more cost-effective. 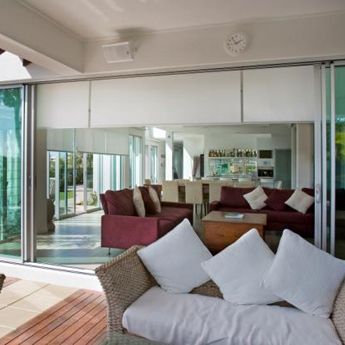 Cellular shades are a beautiful way to control light and provide privacy. You can brighten up any room with the soft, warm glow of light-filtering fabrics or block light and provide additional insulation with room-darkening fabrics. There are a wide variety of colors from which to choose, as well as cell size and fabric texture options. 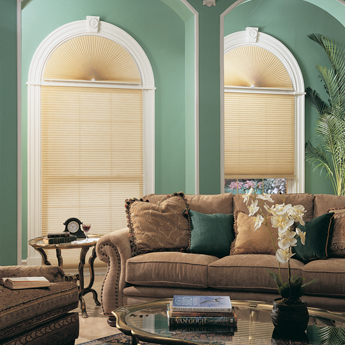 Roman shades enrich any decor, while providing excellent insulation and reducing heating and air-conditioning costs. Choose from light-filtering to room-darkening fabrics that provide privacy and complement any style. Bring the beauty and texture of nature indoors with natural woven shades. The fabrics are natural and man-made fibers combining bamboo, grass, and jute materials. Choose from a variety of colors to complement your lifestyle.